The Power AIM series has been discontinued. We have a unit available for rental. Cost is $250. the first week, and $200 per subsequent weeks. A credit card is required for deposit. The rental will be the only charge unless there is loss or damage. Download link for PA150 @ bottom of page. 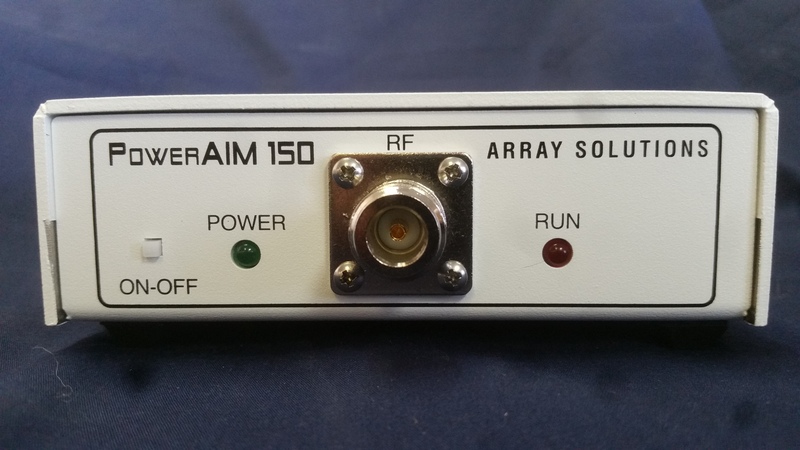 The PowerAIM 150 Vector Impedance Analyzer with patented, unique technology offers the broadcast engineer the full capabilities of a single port network analyzer in a small, lightweight, software-driven instrument that is easy to carry on airlines and in the field. It is very simple to set up and use. 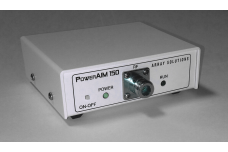 The Power AIM 150 is accurate even at tens of thousands of ohms of impedance. All impedance parameters are measured and calculated. 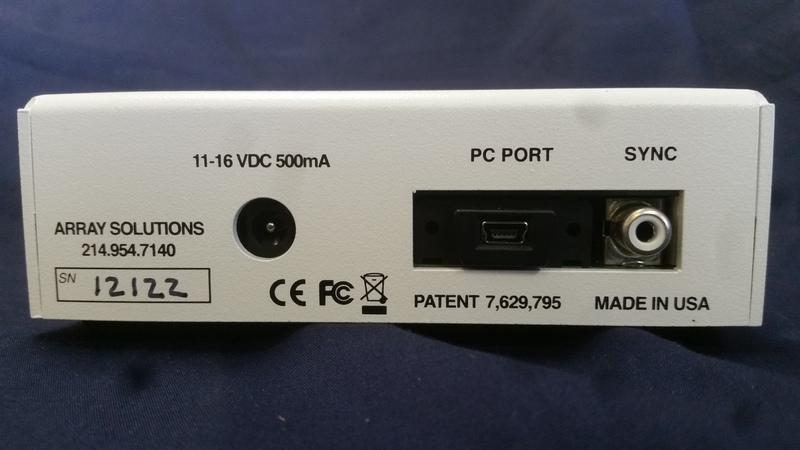 The software for the PowerAIM 150 is loaded on a laptop computer or a Windows tablet for more portability, which is coupled to the instrument via a USB cable. The PowerAIM is particularly beneficial to broadcast engineers involved in the adjustment and final commissioning of AM HD radio transmission systems. The instrument is calibrated in a similar manner to a network analyzer - utilizing an open, short and 50-ohm or other resistance load. The start and stop frequencies have to be specified to define the frequency scan range. Scans can be overlaid on top of each other and also re-cycled to make adjustments in real time. The instrument can be NIST calibrated in the field or in house, so no need to send to expensive labs every year. Measurements can be made at the input port or at the end of a transmission line section or at the end of test leads. The leads or transmission lines can be calibrated out quickly. Besides antennas, any RF component can be measured over any frequency range of the instrument. As one example, it can then be used to scan the input impedance of an antenna tuning unit (ATU). The swept impedance data can be saved in an EXCEL spreadsheet or as a scan file to be recalled later or used as a image for documentation. It is possible to specify the type and length of transmission line between the transmitter output and the antenna tuning unit input plus the phase shift of the transmitter output network in order to display the impedance sweep that would appear at the RF final output of the transmitter for the purposes of optimization of the transmission system for IBOC operation. The swept impedance data can be displayed in a linear data plot showing both rectangular and polar impedance values or in single or dual Smith Chart plots in which case the ATU input sweep could be displayed in one chart, and the transmitter RF final output impedance could be displayed in the second chart. The corresponding VSWR and Return Loss plots can also be displayed. the Power AIM software includes specific tools for IBOC set up, including rotational smith chart, automatic SWR ratio calculator, and more. Markers are easy to apply and remove, and display on the dynamic Smith Charts as well. The Zo impedance can be anything including complex impedances (R + jX) to mimic what the PA section of a transmitter sees. Smith charts are normalized to any impedance including complex impedance. It has a powerful custom calibration function that can completely calibrate out a complex filter or other RF components. The PowerAIM 150 can also be used as an impedance bridge. It incorporates a tone generator with adjustable loudness such that the target setting for a given network branch, for instance, can be pre-defined after which component adjustments can be made until the tone is suppressed; hence yielding the correct reactance. The PowerAIM 150 includes several functions, such as distance to fault, stub macro tool, crystal measurements, and other functions used by RF engineers. The PowerAIM 150 kit includes the portable battery-powered instrument; open, short and 50-ohm calibration loads; a rechargeable SLA (FAA approved) battery with recharger. A rugged carrying case is included to hold it all. 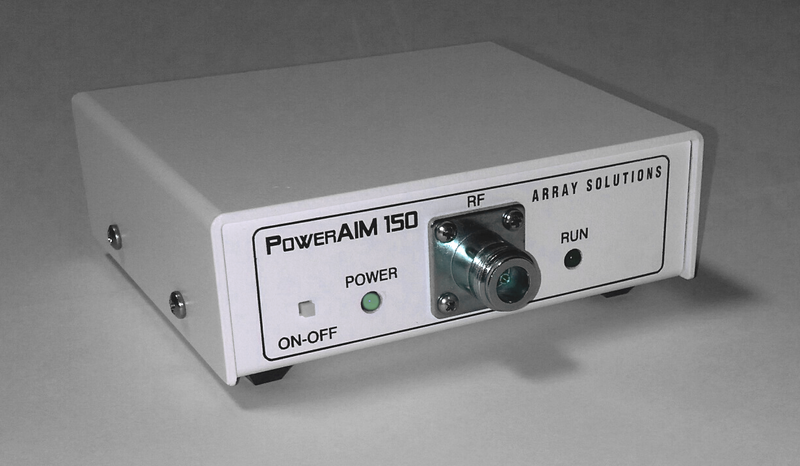 The patented hardware and software DSP filters enable the PowerAIM 150 to measure the impedance of an antenna with as much as 150 volts peak or 106 volts RMS externally generated RF voltage appearing at the input to the analyzer on the same frequency, even though the instrument is producing only a few mW of RF itself. The instrument is self-protected against a higher RF input overload. This feature makes it possible to use this instrument to conduct antenna system impedance sweeps in the presence of incoming co-channel or adjacent channel nighttime sky wave radiation. There are techniques that can be applied to successfully measure antennas with more the 50 volts of RF on them by using a filter or an attenuator. This link will automatically download a ZIP file.